So, feeling bad about not checking on my terns, I’ve paid two visits this week. First, an evening trip after work on Monday. The majority of the noise and activity was from the tern rafts – other birds such as the swifts were not present in great numbers and the big gulls were still down at the far end of the water. The birds seemed to be busy setting up territories with quite a bit of squabbling going on when an interloper tried to land – they could land on certain parts of the raft, but not others. Most parts of the raft had only one bird in place – mainly sitting, have a preen or shouting at the other terns. Sitting around the edge of the raft in general seemed to be tolerated, particularly on the larger, higher new raft. Landing, within the confines less so. I did see some digging around by a couple of birds – not sure what they were digging into or if it was some sort of bonding ritual, and I also saw the presentation of a newly caught fish from one tern to another – that seemed much clearer. I left feeling that all was well with my terns and looking forward to watching them next weekend. However, the weather in between then and now has been terrible -strong winds, thunder, lightning and lots of rain. The results were fairly predictable. Returning today (Sunday) it was noticeable that a number of the older, shallower rafts were under water to some extent again. Whilst they were occupied I think it was just somewhere for the terns to sit and have a rest. I hope that none had laid their eggs in the last week – if they did, will they lay again? I have no idea. The other, more robust rafts, were still occupied although I’m not sure how many birds were there – I saw the tips of some wing feathers peeking over the top but couldn’t be certain that there were more than a couple of birds in residence. I did get a good view of the terns fishing – they looked beautiful backlit by the sun, at times almost hovering, wings and tail spread, at other times they zoomed past so fast on the gusts of wind they appeared as just a white flash through my telescope. More wet weather is forecast for the coming week – I just hope that the birds sit tight and keep away from those old rafts. The water is quite quiet apart from the terns at the moment, but I did notice a fairly sizeable chick with one of the great crested grebes – I guess they nested quite early this year. Note to self – find out when great crested grebes usually nest. I didn’t make it to see the terns with my spotting scope this weekend – too busy Saturday, too sunny Sunday. However, I did go past them early on Sunday morning, unfortunately without any additional viewing aids. They were pretty quiet, not many flying about and I think one of the tern rafts had been abandoned as it had mallards sitting around the edge – will check later this week with a bit of luck. However, I did hear the skylark singing again, despite all the housebuilding that is going on adjacent to the country park and I noticed that the swans had four cygnets – little fluffy grey balls of cute. All else remained quiet on the water, even the swifts and house martins appeared to have gone somewhere else. So continuing my developing desire to learn more about the wildlife, more particularly at the moment, the birds on my local patch I made an effort to go out with my ‘scope again this weekend – despite the dire weather forecast. I had to go on the Saturday as we had agreed to help out with the countryside day on the Sunday, so off we set with telescope and tripod with the sun in the sky, and dark grey clouds massing in the distance. Sure enough, by the time we had made it to the spot where I set up my tripod to watch the terns the distance to the aforementioned black clouds didn’t seem that big anymore (stopping for an ice cream was probably an error). I had just enough time to notice that the terns were still there in numbers when we had to hunker down and wait out the pouring rain and fierce gusts of wind. However, throughout it all the terns were still flying, but they have now been joined by dozens of swifts (as well as house martins, but swallows, not so sure). Once the wind and rain had disappeared it was time to check out my terns and gulls. Gulls were pretty much the same as last time – herring and lesser blackbacks at the far end and one or two black headed around. I didn’t notice the common gulls, but then I was fairly distracted. I checked the tern rafts – lots of birds around, but unfortunately most of the rafts were under water – I do hope that they hadn’t laid any eggs yet. Unsurprisingly the big new tern raft (at least I assume that’s what it is) that rides high in the water was suddenly much more popular. In the past there were only one or two terns sitting on it, this time though I counted eight around the top and there were at least two sitting in the raft – these are the ones I saw when a neighbour tried to land too close to them! I watched the graceful terns patrolling around, tried to follow them in my ‘scope (there’s a reason they are also known as sea swallows) but wherever I looked I would see a dark shape zoom past. The swifts are back! I love sitting on the dam whilst they zoom up and over then zoom back down to fly just above the surface of the water. Where terns appear graceful and serene (until they open their beaks at least) the swifts are manic, always in a hurry, careening this way and that across the water, or screaming high above, their unmistakable scythe shaped wings so dark against a blue sky. From now until August I’m going to be spoilt for choice – terns or swifts – which to watch? Two weeks with a telescope. Following my Easter Monday success I started visiting the country park more regularly with my spotting scope – aided by having a week off work. I started looking at the gulls and trying to see if there was much to be seen as it where. I didn’t expect to see much, after all, the black terns had disappeared and the little gull was nowhere to be seen, but then watching on your local patch is about appreciating what’s there all the time. In the following two weeks I made another four trips to watch the birds. First of all I noticed that the different gulls tend to stick with birds of their own kind (not that different to people maybe). Closest to the shore and therefore people, were the black headed gulls. These are usually the largest in number and are the ones that come to the wooden pier by the visitor centre to feed on the bread thrown to the ducks. Across the other side of the water there were a couple of flocks of larger gulls – lesser black backed and herring gulls. These were mixed but contained more of the lesser black backed – I’m not sure of the reason for this, maybe it is a sign of the decline of the herring gull which is being reported across the UK. Then, somewhere in between there were the common gulls, although most of these appeared to be younger gulls, lacking the clean, ‘pretty’ look of the adults (they have been described as having a gentle appearance – which is true if you get a good look at them). I noted that there were still a lot of younger looking gulls of all four species and wondered when they moult into full adult plumage – even though it was spring, do these still count as first winter adults? I noticed that the young birds all seemed to have a dark band across the edge of their tail, whereas the adults were pure white. I thought at first that this was just for the common gulls, but noticed it for the others too. The black-headed gulls spent a lot of time sitting on the tern rafts and seemed to be tolerated by the terns there, as was the occasional common gull that ventured there. However, there was a communal effort to evict a lesser black backed gull that tried to land – when do common terns start to sit on eggs I wondered? For that matter, where do these gulls nest and breed. I have seen large flocks around various industrial estates, but wasn’t aware of any nesting sites particularly. I had a partial answer to that by my visit on 2nd May – there were hardly any black headed gulls about at all – they had all gone. I assume they had flown off to their breeding sites wherever they are. The situation was still the same on the 4th May, but the common gulls were all but gone as well. I was left with the large gulls and about two dozen common terns. The latter look as though they are settling down on the tern rafts and it suddenly occurred to me that although I have seen them here for years, I have no idea if they have successfully bred or not. I need to know the answer to this and so now have a perfect excuse to spend two or three months with my telescope, not just a couple of weeks. PS – my latest check of Brandon Marsh shows only a few common terns there – therefore I maintain my earlier assertion that the grass is not greener in other nature reserves. Posted on May 7, 2014 May 5, 2014 Categories Birding, Local Patch, NatureLeave a comment on Two weeks with a telescope. No, I don’t mean the 80s pop band (they were around in the 80s weren’t they), but the black headed gulls bobbing about on the water at Daventry Country Park. In my last post I waffled about my discovery of a totally new species for me – the black tern. Well, that wasn’t the only new species that I spotted that day when out with my scope. As I mentioned the black terns seemed to be quicker than the common terns over the water, and I had a bit of trouble following them in my scope. This was made a little more difficult by the fact that I get easily distracted and, on this occasion it was probably a good thing. Bobbing about on the water, seemingly quite happy amongst the bigger gulls, was a black headed gull. Unlike the gulls named black headed gulls (BH gulls), this one did actually have a black head, rather than chocolate brown. I was sadly very excited. Not only because here was the second new species in a day, but because I actually noticed it and decided it was different. Notebook time again (it’s becoming a bit of a habit) and I really wish I could draw, but I can’t so I scribbled instead. I noted that the bird was smaller, as I mentioned above, that it had a black head that came all the way down its neck (that is what I was trying to get at in the picture) and that it didn’t have a white ring around its eye – I somehow knew that this was important (probably due to the huge number of bird books I had read over the years). The bill also looked neater than that of the BH gulls all around it and it seemed to have a pinky tinge to its breast feathers. I’ll not bore you with the details, but this was a Little Gull, larus minutus, unlike the BH gull, appropriately named as it is the smallest gull, and is described as more delicate than the BH gull with which it bears some similarities. So, one trip with a telescope to the country park and two new birds to add to my lifetime list (if I kept such a thing). The appearance of a small, dark stranger. It all started with a tweet on Easter Sunday. Apparently there were 24 arctic terns spotted at Daventry Country Park. I wasn’t convinced, but thought I should maybe pop over and see if I could tell the difference between an arctic and common tern. By the way, I’m not a twitcher, but if there is a chance to see a new bird at the local country park? Well, I’d be a fool not to, especially on a bank holiday weekend. Besides, this means that if nothing else, the common terns were back – if you’ve never seen a common tern close up, gracefully patrolling the shallower water, then you’ve missed out. However, not willing to admit that I wanted to see if I could see arctic terns that possibly didn’t exist some subterfuge was in order and I suggested a walk but only a quick trip into the country park with my small binoculars to see if the terns had come back. This worked and we happily sat for ten minutes or so watching the aforementioned common terns wheeling about. There were other gulls there too, but I was only interested in the terns. However, something else caught my eye, some of the terns seemed darker, but it could just have been a trick of the light – after all, there was some sun despite it being a bank holiday, and I did only have my little 8 x 24 bins with me. I thought about them during the rest of our walk, wondered if perhaps they were younger terns or if I was just seeing things. More information was needed, so I went back later in the afternoon (trying to reduce my exposure to the many families and their dogs off leads that were bound to be there) armed with my telescope and a notebook. darker wings than the common tern, darker below than above. Once back home it was time to hit my myriad of books. 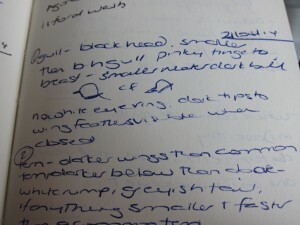 There was only one conclusion, I had spotted some black terns, something I didn’t even know existed until Easter Monday. According to the RSPB handbook of British Birds it is ‘smaller than the common tern’. The Collins Bird Guide gives this description: ‘typical marsh tern. In summer body black, under tail white; slate grey upper wing and tail, underwing entirely silver-grey; bill and legs dark red’ (although on this point the RSPB disagree and claim it has a black bill and it definitely looked black to me). It is a ‘light airy bird that flies with great agility’. This sounds exactly like the birds I had been watching. Unfortunately I don’t have a photo, but there are plenty on the web if you want to see this pretty bird. It is apparently a common passage bird through the UK (which means that you might see it in spring and autumn on its way to somewhere else) and has made a few unsuccessful attempts at breeding in the UK. I was a little unsure as to whether I had really seen some of these until I noticed someone tweeting that there were some at Summer Leys nature reserve over the other side of Northamptonshire – I guess I was right after all and these were probably the same birds. 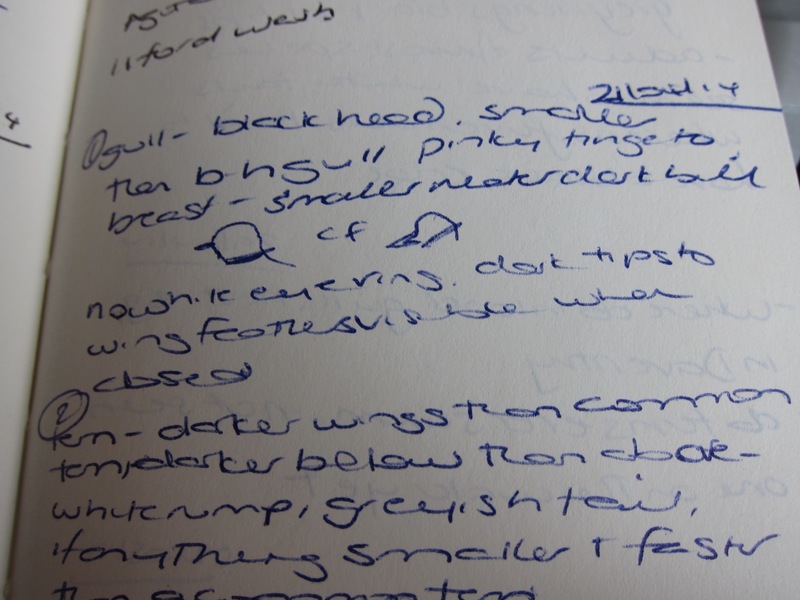 Posted on May 5, 2014 Categories Birding, NatureTags birdwatching, black tern, Daventry Country Park, local patchLeave a comment on The appearance of a small, dark stranger.